The Trump administration’s tough talk on immigration and campaign promises of a border wall have given new meaning to the annual Voices from Both Sides festival on the Texas-Mexico border. 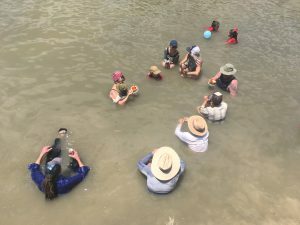 At the event, residents from both Mexico and the U.S. meet in the middle of the muddy Rio Grande to reunite with family members and recall a time when they could cross the border with ease. 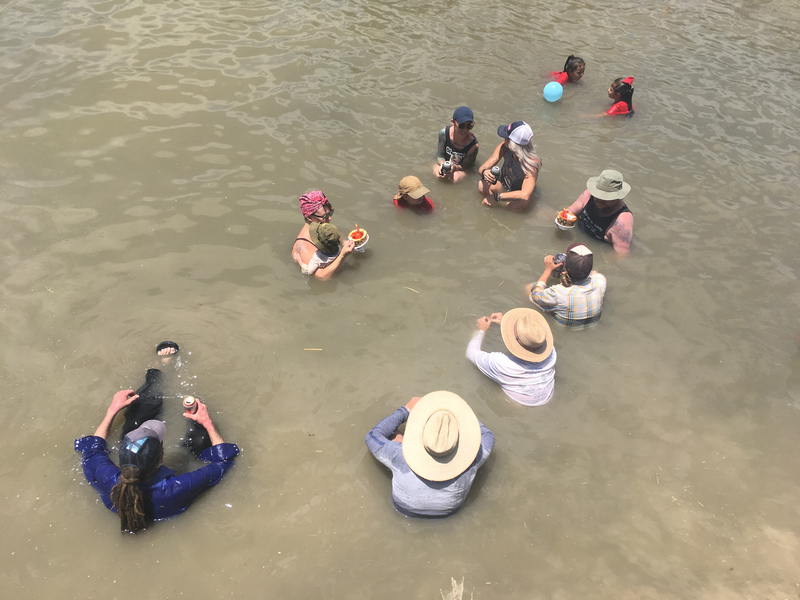 Looking for reprieve from the 100-degree heat, residents of both Mexico and the U.S. are soaking in the waters of the Rio Grande. But that’s not all they’re here for. Marina Rodriguez comes to the Voices from Both Sides Festival because it’s a family reunion. Rodriguez has sisters in Mexico, she says in Spanish, and her family have been coming to the event since it started six years ago in this border community just outside of Big Bend National Park. In the past, residents of Lajitas or Paso Lajitas could hop in a boat here and cross to the other side of the border. It was an informal crossing point. On any given day, a dozen to two dozen people would cross, says Jeff Haislip, one of the festival organizers. Haislip says kids used to make the 30-meter trek across the river to go to school, others just to get a bite to eat. But that changed shortly after the September 11th terrorist attacks, when the government tightened border security. And the informal port at Lajitas closed. When it closed, people here say restaurants shuttered an. The closest port of entry is now 50 miles away in Presidio. This festival calls for this port to be reopened. And Hayslip thinks it’s possible. He says that’s because President Trump has created a conversation on immigration. Crossing the river is illegal. 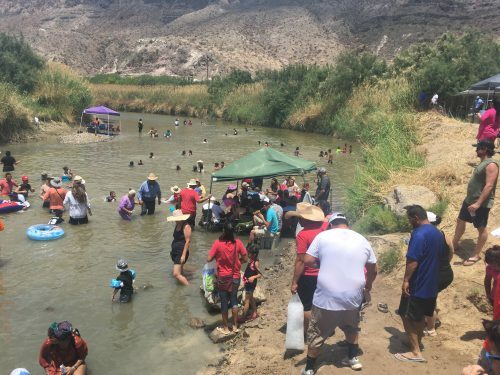 In the first few years, border patrol agents were stationed nearby, watching overhead as festival goers waded into the Rio Grande. But Brewster County Sheriff Ronny Dodson says that presence has tapered off in recent years. 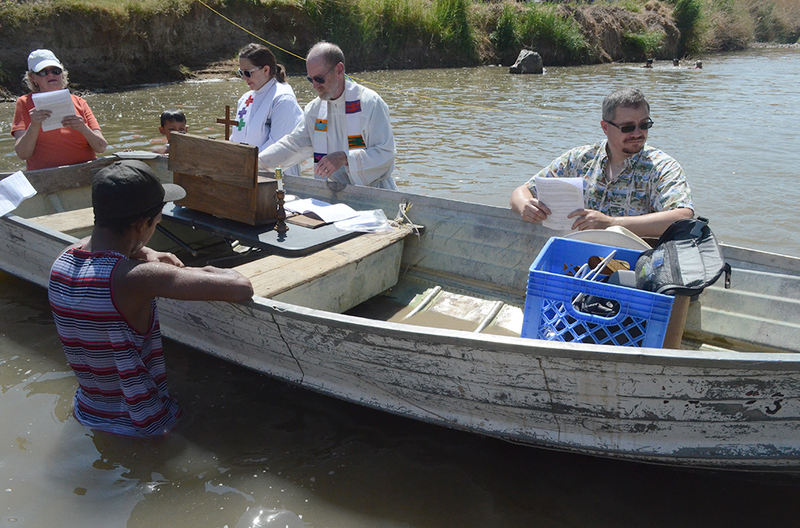 Back at the river, the banks of the Rio Grande have muddied, as hundreds of people cross into the water. There, a weathered boat has become a makeshift altar, as Pastor Sarah Guck and her church from New Mexico are offering communion to people in the river. Guck says the recent talk of border walls and President Trump’s hardlined approach to immigration have given the festival new meaning.“The rhetoric coming out of our administration is giving people an image that doesn’t exist. The image of the border, the difference, you know ‘us and them’. It is manmade. It is not real. On the Mexican side of the river, a man sits in a tree looking over the festival. He doesn’t give his name, but he says he came down from Midland and has been making the trip here for years. The event reminds him that the two towns are like brothers and the people here like neighbors. They need the port of entry to return, he says. And he thinks it can happen now, even with the Trump administration’s strict approach to the border. This entry was posted in KRTS News and tagged Fiesta Protesta, Voices from Both Sides. Bookmark the permalink.